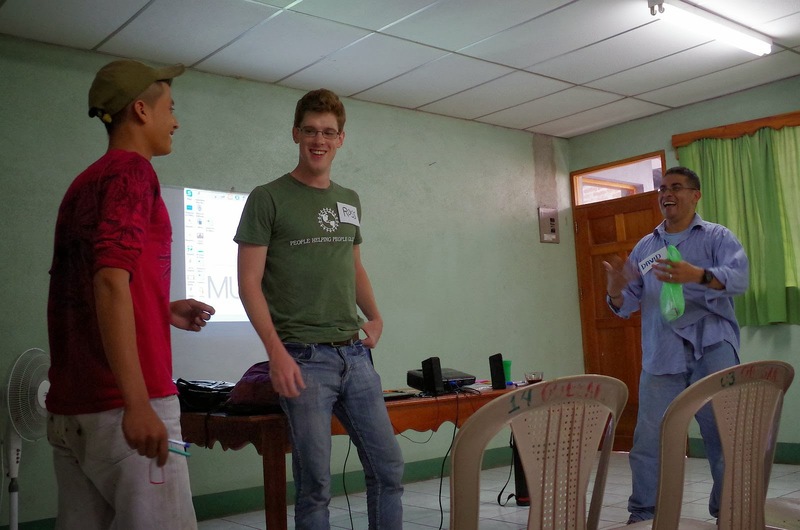 This post is written by Ross Harding, PHPG’s communications volunteer currently staying in the Matagalpa region. Today, I figure it’s a good time to catch up with our big project in Muy Muy that Eric told us about a couple of weeks ago. It also has a lot to do with PHPG’s work in Microfinance Plus programming that Trent talked about a few days ago, where we’re providing both an interest-free loan along with some training and support in order to make the loan really do the most work in helping get results. 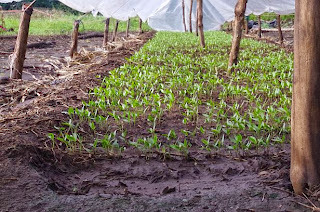 As Eric described in the first Muy Muy post, the project revolves around getting the farmers of Muy Muy black bean seeds, which we expect will give a three-fold return at current prices once we get to harvest time. Because we all know that PHPG operates on a zero-interest model, this means the community will be able to keep a really nice chunk of change that, ideally, can be used to expand their profits even further during the next growing cycle – or whatever else they think is best for their money. They earned it, we just helped. Concerning the Microfinance Plus element, back in September Eric and I attended a meeting with the community where we discussed what our partner organization, Multipro, is offering for the workshops, and what the community themselves were most interested in. Eric at the September meeting where the community chose what workshop topics they were interested in. This month, the first workshop took place. Eric and I were there, and had the pleasure of participating along with them. The subject: conflict resolution. 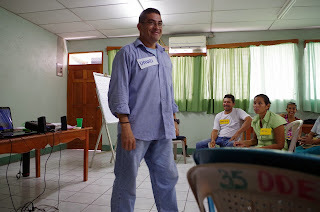 That’s David, who was the facilitator for this workshop. It’s hard to capture this with mere pictures and words, but he’s the kind of guy whose enthusiasm is really contagious. If I were the type of person to be prone to conflict, David’s energetic and engaging presentation would have surely changed my tune. We began with some ice-breakers to get us all a little more comfortable with one another. But in the end, the most assuring sign from the workshop was simply looking at the participants during the presentation and seeing them actually interested, not yawning, chatting amongst themselves, or playing with their phones. In summary, the workshop element of PHPG’s Microfinance Plus project in Muy Muy has gotten off to a very nice start, and I look forward to talking more about it in the future. 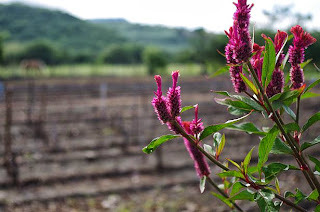 This post is written by Trent Shelton, PHPG's Program Coordinator for the Granada region. 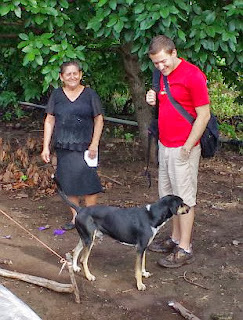 PHPG is run by both Nicaraguan employees and by volunteers. The Nicaraguans are the heart and soul of the operations of the organization. 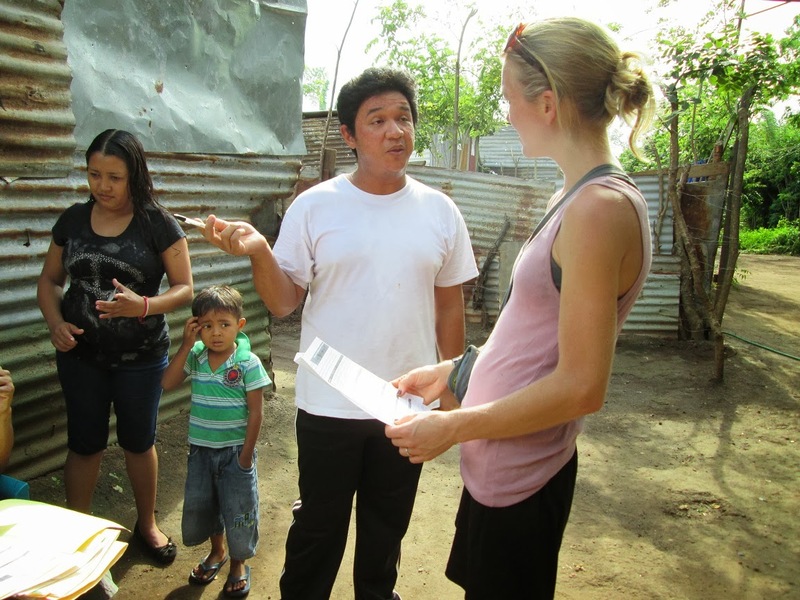 From the loan collections in El Pantanal every Monday and Friday, to conducting potential loan client interviews, to doing quality of life evaluations, the team does it all. The team includes Juan Carlos, Juan Carlos Jr. (Juan Carlos's son), and Tatiana. Both Juan Carlos and Tatiana live in El Pantanal and are both well-known in the community. This is easy to see as we walk the loan collections route; most of the locals stop to say hi to either Juan Carlos or Tatiana. 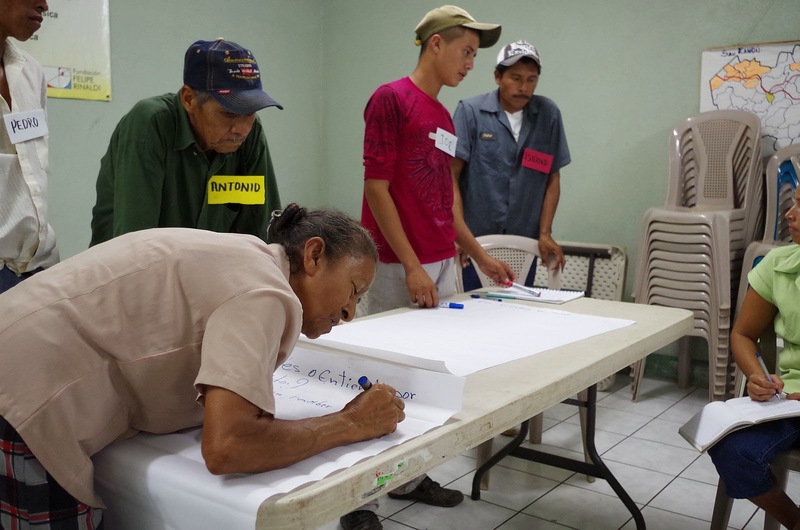 Having this local team from El Pantanal has great benefits for the organization. The employees also have many benefits with the job. Not only are they giving back to their own community, but they have the chance to learn about micro-lending, business practices, accounting, and what it takes to be an entrepreneur. They get to see, up-close and personal, what is working and what is not working with many local businesses in their community. They also gain valuable work experience in a economic development organization. Outside of PHPG: Runs a business out of his house in El Pantanal as a Big Cola distributor, selling gas tanks, and selling Movistar cell phone credit. Interesting Fact: Juan Carlos was drafted into the Nicaraguan national army during revolutionary war in 1983 at the young age of 17 years old, where he was based in the northern mountains near the border of Honduras. 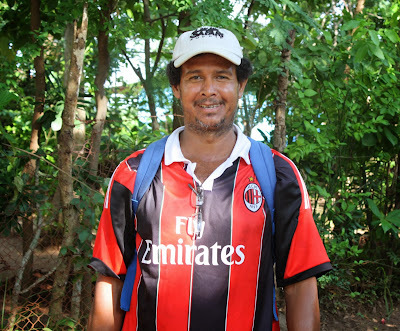 Juan Carlos has lived in El Pantanal for over 15 years but also used to work as a fisherman in Lake Nicaragua. 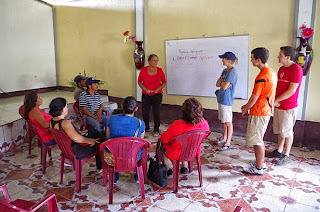 Outside of PHPG: Works for La Esperanza Granada, a non-profit providing teachers and volunteers to local schools. Tatiana splits her time between teaching in schools and working in the Esperanza office. Tatiana is also studying Business Administration at the Hispanoamericana University (UHISPAM), attending classes on Saturdays. As if that wasn't enough, she also helps run her family's pulperia, a corner store selling everything from bread to laundry detergent. Interesting Fact: Tatiana's mother, Ana Mercedes, is one of PHPG's loan clients and a perfect example of the type of client PHPG looks for. She has already completed two loans, using the money to invest in her pulperia. The loans have allowed her to buy inventory in bulk, giving her a cheaper purchase price which gives her a higher profit margin. She has also been able to purchase other types of products in her store which draws more customers. The cash flow from the loans have been critical in helping her grow her business. Ana Mercedes has used her family's increased earnings to make improvements on their house, including raising their roof 3 feet with bricks to provide better ventilation against the heat. 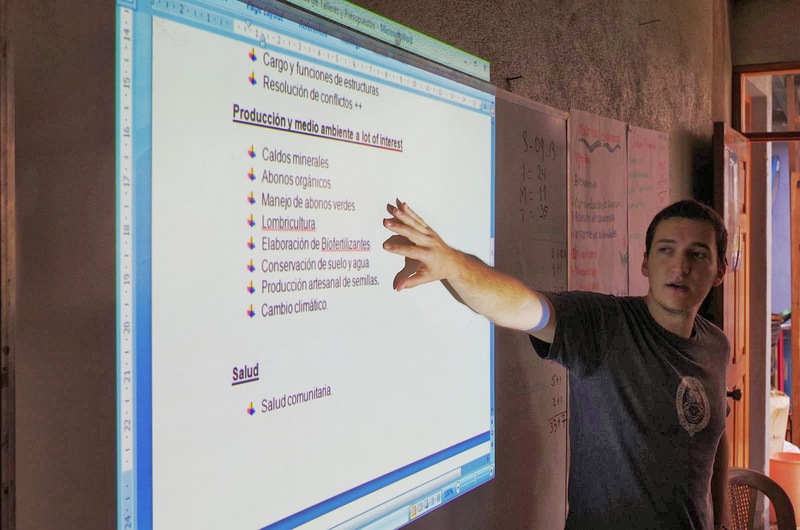 Outside of PHPG: Studies at Colegio Cristiano Restauracion (Christian Restoration High School) with a focus on pharmacy. Interesting Fact: Juan Carlos is already showing his entrepreneurial spirit, as he breeds and sells rabbits as pets. He currently has 8 rabbits used for breeding. He sells the baby rabbits to friends and family for $4 each. Juan Carlos makes the trip from Masaya to Granada to work for PHPG. 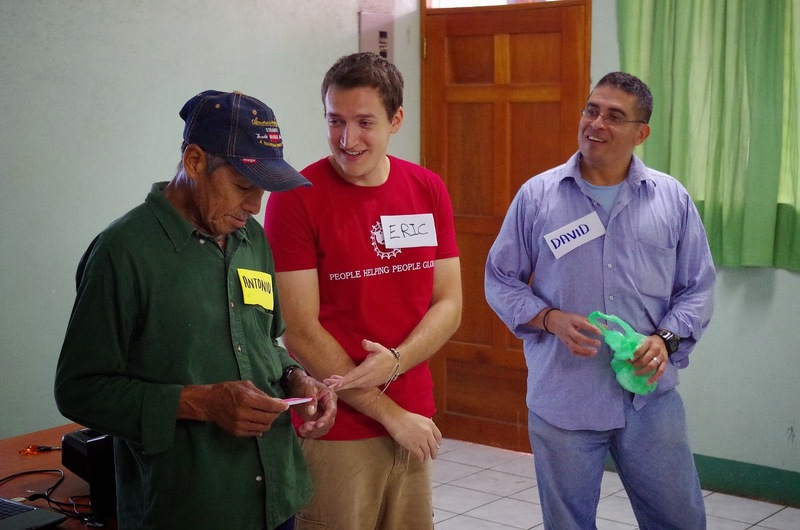 This post is written by PHPG's Matagalpa region volunteer, Ross Harding. 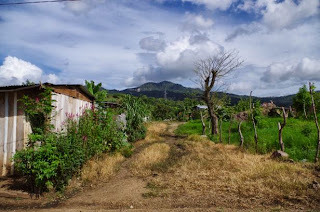 San Juanillo is a small rural community a couple of hours away from Matagalpa by bus. Although the journey can feel rather long, the natural beauty of Nicaragua at least makes for a pleasant view from the bus window. San Juanillo is one of PHPG’s longer partnerships in the Matagalpa region. Our project here is part of our partnership with EOS International, which we also talked a bit about in an earlier post. In the communities where we have partnered with EOS, generally our loans take the form of sustainable technologies such as fuel-efficient ovens or drip-irrigation systems. We also give a bit of capital, around $55, to help jump-start their business activities. With the help of PHPG and EOS, the communities we work with are able to secure livelihoods that they would have a hard time achieving otherwise. So, how are things coming along? Regional Coordinator Eric and yours truly recently visited the community for one of our monthly collection dates. Arriving at the local group leader’s farm, I couldn’t help but gawk at much of the picturesque beauty. Yet it is important not to romanticize things too greatly; our mandate is working with people who make on average less than $2 per day, which means despite the natural splendour of the land there is still real hardship. Thankfully, so far our efforts have contributed to lessening that hardship for the group we’ve been working with. Although there have been months here and there when one of the members might not be able to make the repayment (which is to be expected given the uncertainties of agricultural work), it’s certainly not a pattern. 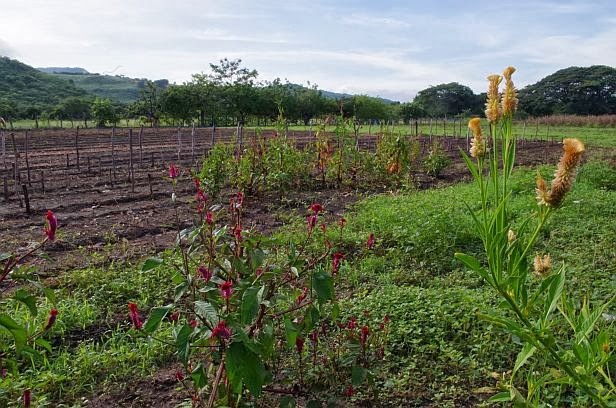 The San Juanillo group is leveraging the opportunity we at PHPG and EOS have been able to provide, and are well underway to paying it off completely. 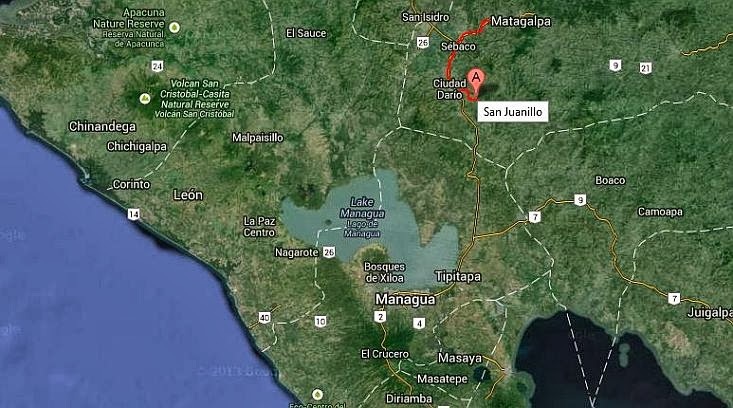 So, in short, things are looking pretty healthy over in San Juanillo! We’ll definitely give another update on how things are going in this neck of the woods next month. It may be a bit of a trek to get to San Juanillo, but the gracious people, beautiful landscapes, and meaningful opportunities are certainly all worth it. This post is written by Trent Shelton, PHPG's Program Coordinator in the Granada region. 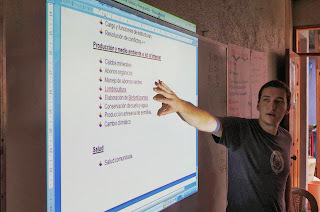 PHPG’s core function is to give microloans ranging from $120 to $280 to local entrepreneurs in Nicaragua. However, just as important as giving a loan is providing an opportunity to develop business skills and business education. This is often called Microfinance Plus. In the month of October, we have a volunteer by the name of Bernie Ringer-Britz. Bernie has an incredible background with a wealth of business consulting experience. His knowledge and desire to help others has been extremely helpful for our clients and other community members. He has sat down with numerous clients to review their business one-on-one. He has given clients many new ideas for their businesses as well as giving a fresh look at their operations. 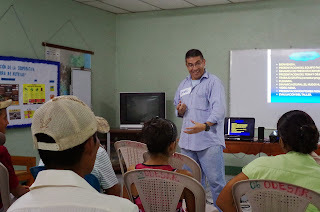 This past Sunday evening, we invited our entire group loan clients in El Pantanal to a taller, a business workshop. With a good turnout of 35 clients, we handed out a simple accounting sheet for the entrepreneurs to track their inventory, calculate their net income, and to figure out their margins for each product. The clients were very interested in the sheet and were excited to learn how to use it. Possibly the biggest difficulty was the wide range of age and education levels within our clients. The age of the attendees ranged from 18 years old to 75 years old. Education levels range from elementary school to possibly having studied in college for a few years. Teaching to 35 students with this big of a range proved difficult; but after splitting into smaller groups, our clients walked away with an understanding of how to do basic accounting for their respective businesses and were ready to put these into action. In the future, we will be visiting each loan group individually to reinforce the concepts and to ensure everything is going smoothly with the accounting sheets. Located just two kilometers southwest of Matagalpa is a humble community called Susuma. Getting to Susuma requires a one-hour hike from the center of Matagalpa which takes you past the cemetery and into the countryside. Last Sunday, Susuma became PHPG’s newest community, as one group of six clients was selected as loan recipients. Prior to the loan distribution, the PHPG team conducted interviews on 20 perspective borrowers and also held various meetings about the loan processes and rules. In the final meeting before loan selections, one loan group made an especially good impression on the PHPG team. All groups are required to fill out an official document to form the group, including a team name, who will be the group leader, etc. This group, called Dios Es Amor (God is Love), was very organized and democratic. A young woman, named Maria de Los Angeles, immediately took the initiative and made sure everything was completed fairly with a vote. From voting on the team name to making sure everyone knew each other’s addresses, she led the team perfectly. She was unanomously selected by her group peers to be the group leader. 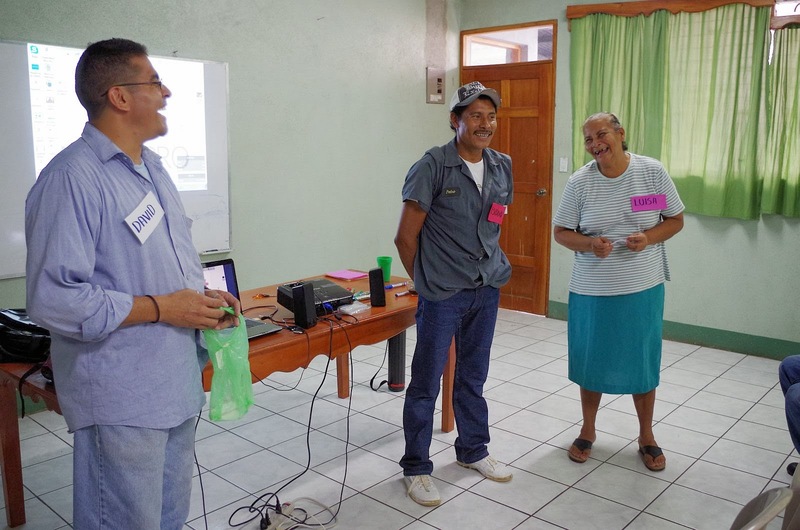 This group’s organization and positive energy made Dios Es Amor an easy selection for Susuma's first loan group. We look forward to expanding our loan portfolio in Susuma in the future! We at PHPG are continually looking for expansion. To streamline the new loan process in El Pantanal, we only take loan applications three times per year, including in March, September, and December. Because six months had passed since our last loan distributions, people in the community were anxious to apply and to go through the interview process. This was apparent as our team made rounds in the community during normal loan collection days; people continually asked more about the loans and how they can apply for the next loan distribution. PHPG’s director, Isabel, made the trip down to assist with the loan selections. We conducted over 30 client interviews which consist of a home visit and rigorous questions about their business, their family, and their lifestyle. Several were second loan applicants, but most were applying for their first loan with PHPG. It’s easy to see the excitement in the eyes of the applicants. For many, no one had given them the chance to take out a loan, and especially not a loan with 0% interest! After the interview process, we met as a team to make final decisions on who will be receiving the loans. We have selected five loan groups made up of 22 loan clients with a total value of about $4,000. The loans will be distributed with our standard process; half of the loan will be distributed on the first disbursement date while the second half will be distributed one week later, after the clients show the receipts of the purchases made with the first half of the loan. The PHPG team will start the loan collection process the week following the initial distribution which consists of making rounds by foot in the community to each group leader's house. This post is written by Eric Pires, PHPG's Program Coordinator in the Matagalpa region. Matagalpa is a unique region of Nicaragua. The regional economy is heavily dependent upon the agricultural industry. The backbone of said economy is based around a variety of cash crops such as coffee and cacao. We have been identifying agricultural opportunities that capitalize on farmers’ capabilities as growers. Our most recent project has been through a partnership with a cooperative of fifty farmers and beekeepers in Muy Muy, Matagalpa. After discussing our financing opportunities, they approached PHPG with a project proposal. 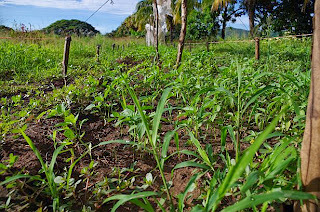 The cooperative has been seeking sources of credit to grow black beans. The local market for such beans is quite small as consumers in the region prefer red beans. That being said, the export market for black beans means that farmers could fetch a far higher price for their beans. As it so happens there is another cooperative in the region purchasing bulk amounts of black beans from farmers to export to Venezuela. What PHPG has done is facilitate the meetings between the grower and buyer cooperatives leading to a purchase order for beans at a guaranteed price for our clients. The price may rise leading to even better prices but at the price we have negotiated they are guaranteed to triple their return on the initial investment. As soon as the contracts were signed, PHPG released the loan capital to the grower cooperative for them to buy bean seeds and begin upon this initiative. A portion of the loan capital has also been used to buy fertilizer and other agricultural inputs the farmers will need. We are also taking this opportunity to pilot a Microfinance Plus project. This project goes beyond offering loans to clients by also offering capacity building workshops. 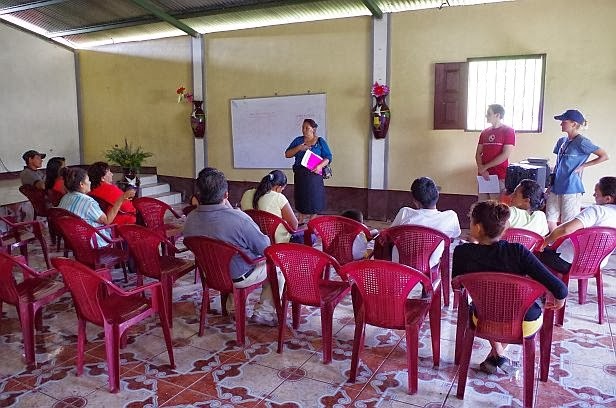 Together with the members of the cooperative, we have identified a series of workshop subjects ranging from sexual hygiene, water conservation and basic business marketing. We are contracting a group of experts in the region to design and implement the workshops on a monthly basis in collaboration with our clients. As well as improving their quality of life, we are hoping that through the workshops our clients will be able to develop innovative business ideas and opportunities they would like to pursue with future loans. This project has been able to come together with the help of several other organizations operating in the region. 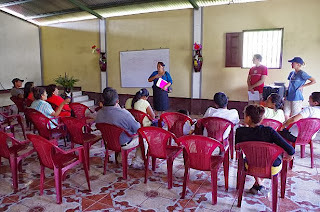 ODESAR has been facilitating our meetings with the grower’s cooperative in Muy Muy. The Pulsera Project has supported us and contributed greatly to the financing of this project. They have been fundamental to PHPG’s ability to grow into new sectors and explore new initiatives in Nicaragua. Check back soon as we add more information on the progress with our Black Bean Project in Muy Muy. 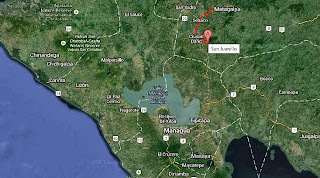 Twelve miles west of Granada, in the Masaya province, lays a town called San Juan de Oriente. As you work your way up from the lowlands of Granada, you start to feel the temperatures drops and the pace of life become a bit slower. From the main highway passing by, you’d never know what San Juan de Oriente offers. The town’s economy is based on the production of ceramics. It is said that 80% of the town population are involved in ceramics. The ceramics created here in this humble town are internationally famous. This is with good reason, as the ceramics are incredible pieces of art. The world-class artists send their products all over the world and even host a few competitions in their town that draw wide attention. One may wonder why this town of 5,000 inhabitants is specialized in ceramics and so good at what they do. In the 1970s, several international organizations made a big push to revive the traditional craft. Ceramic specialists from North America, Europe, and Cuba, came to San Juan de Oriente to train the locals on the art. The excited community had a great feeling about the future of ceramics and what it may bring to the local economy. For many, it has done wonders for their financial situation. Others are still struggling due to the relatively small market in Nicaragua. PHPG has now entered into a new partnership with Esperanza en Accion, a fair-trade non-profit organization specializing in Nicaraguan ceramics and crafts. 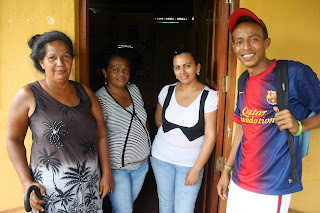 With the partnership, PHPG has given one group loan consisting of six artisans who also work with Esperanza en Accion. 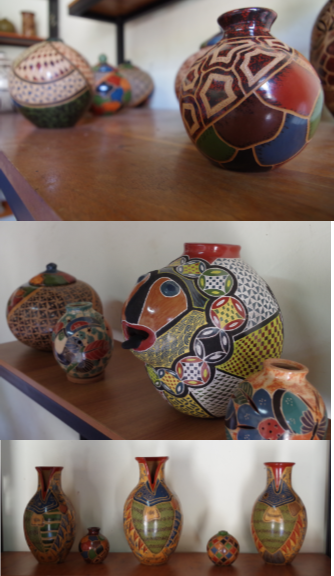 Each of the artisans creates ceramics, and each will use their loans in a similar manner. Financially, the artisans have difficulties in buying the light blue color of paint that is used. This color, celeste, is only produced in the US and is then exported, making it very expensive. Making the cost even higher is the fact that there is only one place in San Juan de Oriente that sells this type of paint. Putting the cash upfront to purchase this paint can be extremely challenging for a local artisan. With PHPG’s loan, each of the six loan clients will have the ability to make this purchase to continue using the beautiful light blue color in their crafts. 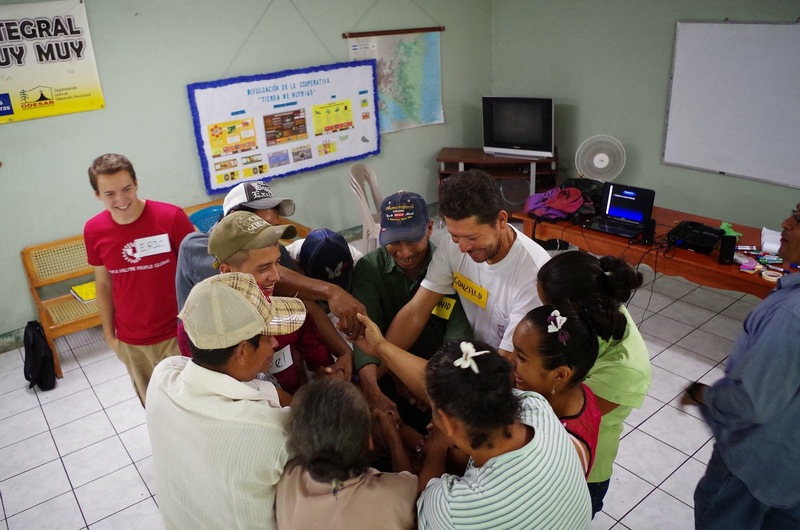 We’re looking forward to working more with Esperanza and Accion and ceramic artisans in San Juan de Oriente!